A year after the events of Age of Ultron, the Avengers (well, most of them) are reunited in unhappy circumstances. Following the deaths and destruction in their dust-ups with dastards, world leaders demand henceforth that the gang operate under a UN panel. Surprisingly, it is Robert Downey Jr’s perennial maverick Tony Stark / Iron Man who readily agrees to submit to authority and oversight. Chris Evans’ one-time dutiful soldier Steve Rogers / Captain America on the other hand defiantly resists, arguing for personal freedom and choice. Friends and allies bitterly divide into two camps. And a mysterious new foe (Daniel Brühl) orchestrates what will escalate, inevitably, into spectacular battles and colossal property damage. 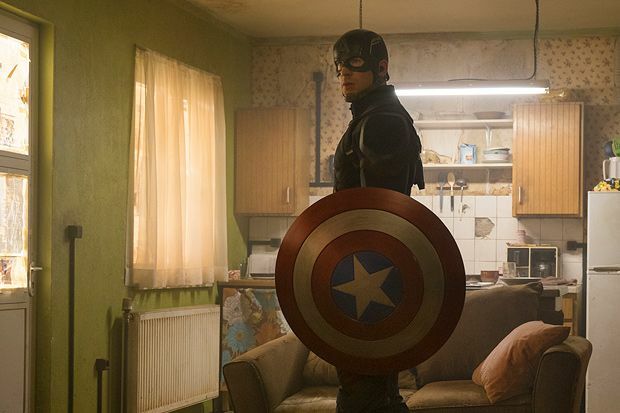 It’s apparent Civil War (directed, like its predecessor The Winter Soldier, by the Russo brothers) is not just the third instalment in Cap’s adventures but the latest episode in the superhero soap opera that is the Marvel Cinematic Universe. If you haven’t seen the previous Captain Americas and Ultron – at least – you have no hope of working out who people are or what is going on, and you will have to fight the urge to ask someone, ‘Where is the Hulk? What happened to bow and arrow guy? When did Paul Bettany’s disembodied AI Jarvis turn into a levitating robot?’. It is also the first film in the ambitious franchise slate designated as Phase Three, so fans can rejoice in the appetite-whetting debuts of Tom Holland’s puny Peter Parker / Spider-Man and Chadwick Boseman’s purrfect T’Challa / Black Panther in the crowded character mix. Plot points and personal revelations sown throughout the franchise bear bittersweet fruit. The genius in this is its combo of hectic action (a shout-out out to Paul Rudd’s Ant-Man, who gets a sensational bit) and Starkean one-liners with intimate, heartbreaking moments for individuals and duos. Those who have invested themselves in the 12 (12!) Marvel films leading up to this will be forcibly struck by how far characters have come and how much depth performers like Scarlett Johansson as Natasha Romanoff / Black Widow now bring to this party. There is real maturity in a story of guilt, revenge, torn loyalties and tragic revelations – between the fights, explosions, chases and general awesomeness. General release from Fri 29 Apr. When world leaders demand that the Avengers operate under UN supervision, the team splits. If you haven't seen previous instalments it will make no sense, but if you have, all the plot points bear bittersweet fruit, in a brilliant combination of hectic action and one liners with intimate, heartbreaking moments.